The Aristocrat-powered Werewolf Wild will take you to London at night where a werewolf prowls around looking for a prey. However fearsome it may seem, the reel symbols are designed with a cartoonish and funny twist to them. 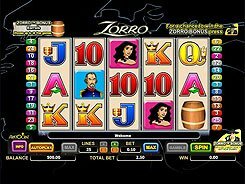 The slot has 5 reels and 25 fixed paylines, and the only adjustable betting option is a stake per line that is in the range of $0.5 to $100 per spin. 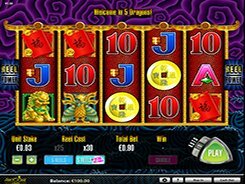 The slot has a free spins feature activated by three or more Full Moon symbols; hitting 3, 4 or 5 scatters awards 7, 14 or 28 free games, respectively. 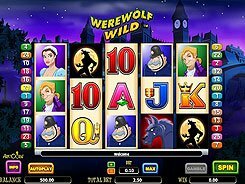 During the free spins, every wild Werewolf appeared on the reels “infects” any neighboring human symbol making it morph into another wild. The “infected” symbol becomes contagious and turns other human symbols it touches into wilds, thus producing a kind of a chain reaction. Another amazing feature is the Claw Swipe that triggers randomly during any spin in a normal game and transforms 2 to 5 random symbols into wilds. 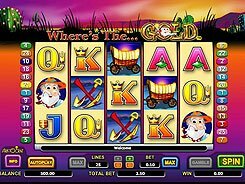 The biggest fixed jackpot of $4000 is awarded for hitting 5 wild icons across an active payline.